I started a new little cardigan the other day. The yarn I am using for it is Knit Picks Galileo. I can’t say enough good things about this yarn. It’s a bamboo/merino wool. It’s very soft and has such a pretty sheen. I am knitting a pattern from a designer whose blog I have followed for a long time. The blog is in French, but I love just looking at the pictures of the beautiful things she designs and knits (fortunately, she provides the pattern in English). So I started this little sweater. It has lace across the front. I knitted several rows and I saw that the lace was not coming out right. So I pulled it out and started again. I thought I must have been off somewhere, but I basically did the same thing over again. Reminds me of the quote: “Insanity is doing the same thing over and over again but expecting different results.” (I thought Einstein first said this, but apparently this may not be the case.) But I like that quote. It’s apt because that is what I did. I was getting very frustrated and mad at myself. I don’t like it when I just can’t figure something out. Fortunately, there is ravelry. I went through the project notes of several other knitters who have knitted this pattern. Thankfully, one of these knitters enlightened and saved me! 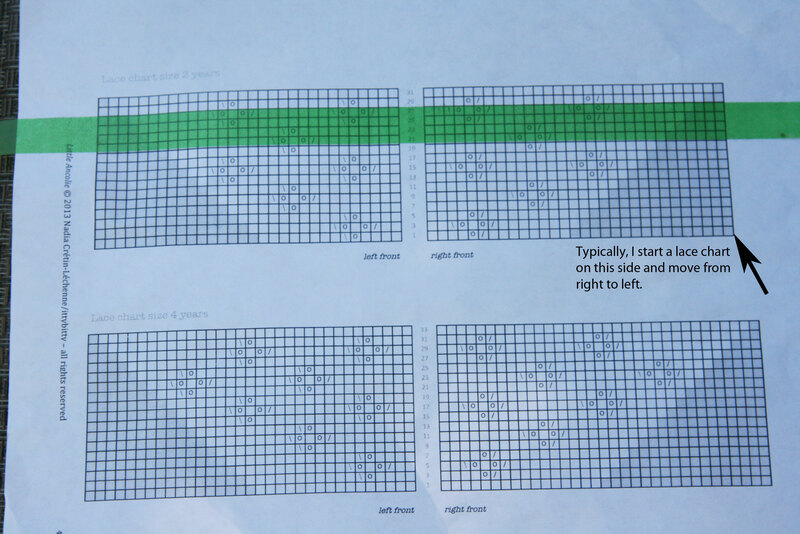 So typically when you knit a lace chart you start on the right side and go left. But when you have lace on the front of a cardigan this won’t necessarily work. 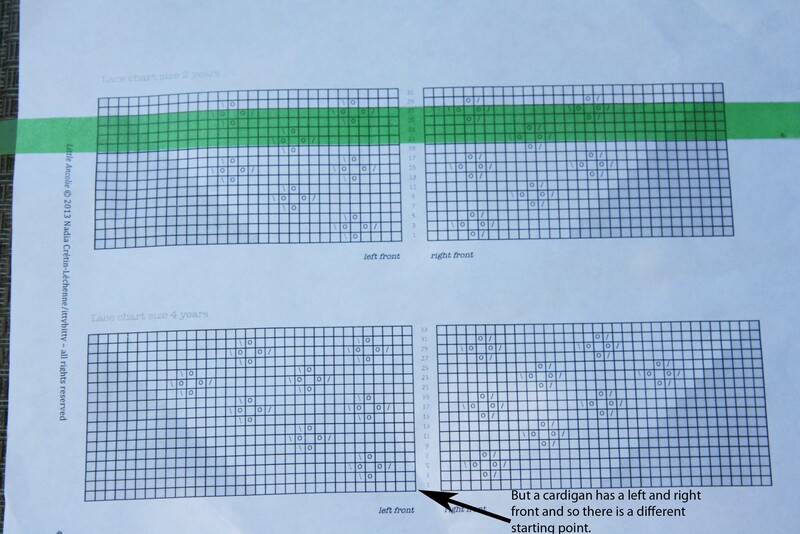 You have to take into consideration that you are just knitting the front, and also that there is a divide between the left front and the right front. I was very very very happy when I figured this out with the help of ravelry. Third time was a charm and it’s gone easy as pie since then. The purple yarn at the top is an indication of something else new that I learned. I did a provisional cast on (so I can add the neck border later). I’d done this type of cast on before, but not quite with this technique. I used the knitting needle and a crochet hook. The video I used made this very simple and easy to understand. It’s going to be really pretty, and it’s a fun pattern to knit! This entry was posted in Knitting and tagged cardigan lace, crochet provisional cast on, itty bitty blog, knit picks, knit picks galileo, lace, Nadia Crétin-Léchenne, provisional cast on by cpeezers. Bookmark the permalink. I’ve done that provisional cast on for a pair of toe up socks. I liked it too. 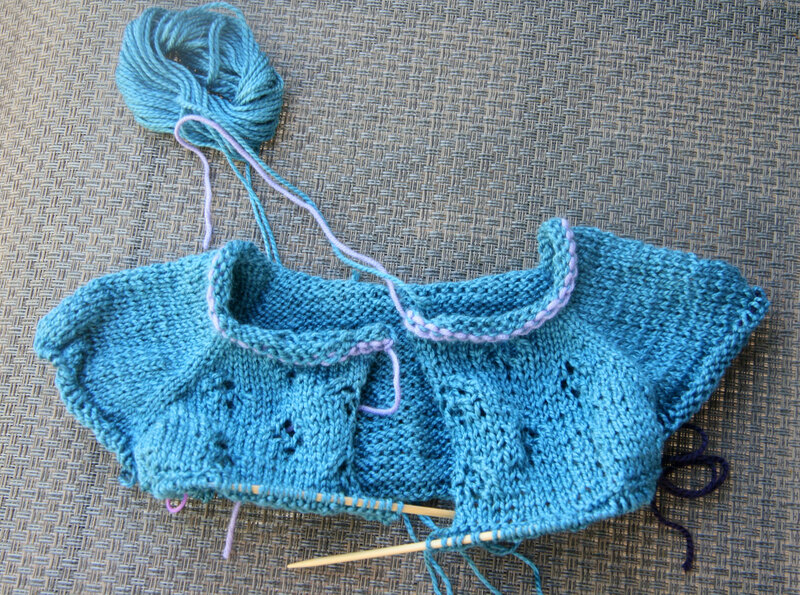 The teeny cardigan is going to be adorable! Google Translate is my friend. 🙂 Although some of the translations are a bit off, it’s good enough to figure out what is actually meant. The cardigan is gorgeous; it’s a great feeling when you figure out something that has been bugging you.